The FTSE Value-Stocks ASEAN Index consists of 50 quality value stocks amongst liquid and tradable ASEAN companies listed on the Indonesia Stock Exchange, Bursa Malaysia, the Philippine Stock Exchange, Singapore Exchange and the Stock Exchange of Thailand. Of the 50 constituents, 10 are listed on SGX. The next Index review is scheduled for the third Friday in May. Over the last three years, the FTSE Value-Stocks ASEAN Index has generated a total return of 35.0% in USD terms, outperforming total returns of 32.3% and 14.4% for the FTSE/ASEAN 40 Index and the FTSE ASEAN All-Share Index respectively. The 10 SGX-listed constituents of the FTSE Value-Stocks ASEAN Index have a combined market cap of more than S$200 billion. They averaged a total return of +5.6% in the YTD, bringing their 1Y, 3Y and 5Y total returns to -8.9%, +46.0% and +53.5% respectively. They also averaged a dividend yield of 3.6%, PE ratio of 12.5 and ROE of 10.4%. 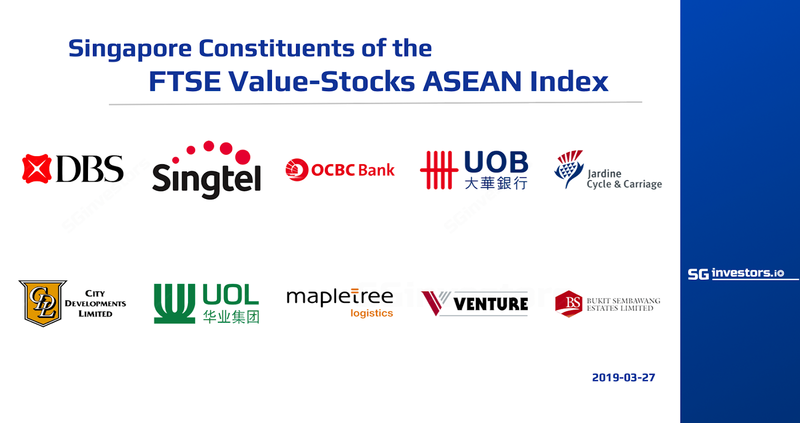 The FTSE Value-Stocks ASEAN Index consists of 50 quality value stocks amongst liquid and tradable ASEAN companies listed on the Indonesia Stock Exchange, Bursa Malaysia, the Philippine Stock Exchange, Singapore Exchange and the Stock Exchange of Thailand. Of the 50 constituents, 10 are listed on SGX. The FTSE Value-Stocks ASEAN Index, launched on 12 November 2013, is a value-based index designed by Value Partners Index Services, and created, calculated and maintained by FTSE Russell. These value-based equity indexes combine FTSE’s globally recognised index expertise with Value Partners’ experience in disciplined value investing. The FTSE Value-Stocks Indexes offer market participants an opportunity to access value stocks in the respective markets through a transparent and rules-based approach. To ensure that a continuous and accurate representation of the market is maintained, a regular review of the Index is scheduled after the close of trading on the third Friday in May and October 2019. For more details on the methodology, click here. In the last 3 years, the FTSE Value-Stocks ASEAN Index has generated a total return of 35.0% in US dollar terms, compared with 32.3% and 14.4% for the FTSE/ASEAN 40 Index and the FTSE ASEAN All-Share Index respectively. Over a 5-year time frame, the FTSE Value-Stocks ASEAN Index has clocked a total return of 14.3%, compared with 20.7% and -5.4% for the FTSE/ASEAN 40 Index and the FTSE ASEAN All-Share Index respectively. Note that the FTSE ASEAN All-Share Index ‘s inception date of 28 May 2014 was used in the calculation of its five-year total return. The 10 SGX-listed stocks in the FTSE Value-Stocks ASEAN Index span the consumer, real estate (including real estate investment trust), information technology, banking and finance, as well as telecoms services sectors. They are: Bukit Sembawang Estates, City Developments, DBS Group, Jardine Cycle & Carriage, Mapletree Logistics Trust, Oversea-Chinese Banking Corp, SingTel, United Overseas Bank, UOL Group and Venture Corp. The 10 constituents, with a combined market capitalisation of more than S$200 billion, have averaged a total return of +5.6% in the 2019 year-to-date. This brings their one-year, three-year and five-year total returns to -8.9%, +46.0% and +53.5% respectively. The 10 stocks also averaged a dividend yield of 3.6%, price-earnings ratio of 12.5 and return on equity of 10.4%. The 3 best-yielding Singapore constituents of the FTSE Value-Stocks ASEAN Index were: SingTel (5.9%), Mapletree Logistics Trust (5.5%), and DBS Group (4.8%). The 3 constituents with the highest ROE were: Venture Corp (16.4%), Mapletree Logistics Trust (11.8%), Jardine Cycle & Carriage (11.7%). In the 2019 YTD, the 3 best-performing SGX-listed constituents of the FTSE Value-Stocks ASEAN Index were: Venture Corp (+25.1%), Mapletree Logistics Trust (+16.0%) and City Developments (+9.2%).